November 2008 – Sonja I.
I bought my first stamp in the fall of 1988 in Minot, North Dakota at a craft fair that I attended with my family & husband. My oldest daughter was only 6 months old! The first “supplies” I bought were a cute bear stamp and a rainbow stamp pad. When I got back to Canada, I bought more stamps, took some stamp classes…and never looked back! I’ve been stamping for about 20 years now. I love the look of polished stone, the colour choices are always endless. You can create different looks each time with the same colours and I love using different metallic colours to blend in with them! There are too many stamp companies out there I love to get products from, but being Canadian, I have to say I Magenta. The styles are definitely distinct from all other companies. I can usually tell a card made with Magenta stamps. 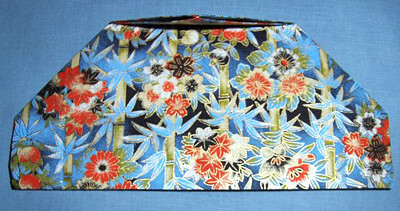 I love dragonflies, kimono, Geisha, bamboo, panda, pretty much anything Asian I can get my hands on and work with! Definitely Washi paper as well as brads in all shapes, colours and sizes, stickers, ribbons, tassels, whatever makes my art work look finished! I love jewel tones such as burgundy rose, royal blue, rich purple, teal green, and neutral tones such as shades of tans, browns and black. My favourite colours to work with in Asian work is red and black, although, I do love working with the jewel tones in my Asian artwork as well! And I’m a hopeless one for metallic! I love anything shiny & sparkly! “Peel-Off” stickers have been my most recent “favourite”, although I do like to embellish with flowers and brads or anything else I can find. I have a whole ‘suitcase’ of embellishments! My Fiskars personal paper cutter! I used to cut everything by X-acto knife and cutting mat when I first started stamping…this cutting tool was the best invention ever…and then they made a scoring tool to go with it…better yet! Scan, photograph or make a second copy of your cards/artwork whenever you can. This way you have a way to keep a replicate of what you’ve made and if you ever want to make another down the road, you’ll have something to look back on for reference. Joining swaps will help get those creative juices flowing for getting new ideas when you’re just not sure what to make “next”. In grade 6, I had to do a report on Japan and present it in front of my class. My parents knew a couple (good friends of theirs), he being a British journalist and she, his Japanese wife who were willing to help me out with my project. I got the report done with help from both Bob and Akiko and got to present it wearing a beautiful Kimono that Akiko dressed me in! I remember it took almost an hour to get dressed in it, right down to the tabi and geta! This was the most memorable moment as I was growing up and made quite the impression on me! Well, needless to say I was drawn into and fell in love with the Japanese culture because of this. I really enjoy creating anything with an Asian ‘twist’ to it!. I belong to a lot of Yahoo groups, too many really, and it’s hard to keep up with them all: Book Arts, CST (Canadian Stamp Talk), Cre8it, Spellbinders Wizard, Digital Princess Designs (a Canadian Stamp Company), StampnBond (Canadian group), just to name a few. I also belong to our local calligraphy society and a rubber stamp club-PMS (Pretty Mean Stampers). Don’t ask me when I have time to keep up with all these groups…believe me, it’s hard to do when I’m working almost full time out of the home! There are a lot of good ones out there. I tend to buy more books than magazines, but when I do purchase any, they are usually Stamper’s Sampler, Australia Paper Crafts, Rubber Stamper, and sometimes Scrap and Stamp. I have been published in magazines of the “past”…ones that have since ceased to exist: Two Canadian black and white publications; ‘Stamp Stories’ and ‘The Canadian Stamper’. I also was a regular for the first couple of years that ‘Expressions’ magazine came out…I believe about 4 -5 publications. I also have been published in our calligraphy society’s newsletter numerous times and have written articles for them. I have been highlighted online on ‘Quietfire Design’ and won a stamping contest on Bunch ‘O Fun rubber stamps and had my artwork published on their website! I think I’ve tried every possible type of “craft” out there…I particularly like to crochet, knit, bead, make books, rubber stamp and marble paper. I also have my own marbled paper business on the side: http://www.paperpassions.com/ which I started in 1999…it’s slowed down a bit now that I’m back working…I do get repeat customers, though, which I’m thankful for! Does high school art classes count? I actually took classes in clay work and wheel throwing (claywork-wheel throwing, NOT really throwing wheels around!!! *grin*), but am pretty much a self taught artist. I have no formal training, although I have taken many workshops and classes from who I would consider “master” artists! If I had the time and money, I’d go back to university (again) and take fine art classes! I’m sure I have, but usually it’s creativity born out of necessity and then I don’t even think about it as not being part of my stamp art! I’ve used chopsticks, toothpicks (as parasol holders), bamboo mats, ceramic tiles, drinking glasses, obvious ones like paint chips, dominos etc. There are a lot of incredible websites out there that have some really neat ideas! I am partial to OSA as it was only by searching on the internet for Asian inspired websites that I found it! Some of the artwork in OSA’s art gallery is truly ‘eye candy’! I trained as an RN before I was married and worked first in medicine and then pediatrics. After I had our girls, I let my registration go to the wayside to raise them and then recently joined the public school board to work as a teacher’s aide and now an elementary school librarian! You know, work can really get in the way of my creative spirit, but I need to earn money to buy all those “need to have” new products out there! I have been married for almost 23 years to my husband (George) and am mom to 4 girls – Kirstin 20, Bethany 18, Melanie 17 and Heidi 15. Even our dog is a female…my poor husband sure feels out-numbered! We live in Edmonton, Alberta, in Canada. Our city may seem pretty far north to some people, but really we’re not as far as you may think! I love the fact we get 4 seasons here…albeit spring and autumn can be shorter than they should be, and we sometimes get way too much snow for my liking in the winter but the HOT summers make up for it! I also love the fact that in the summer, the sun doesn’t set until almost 11:00pm! But our winter days are pretty short! I have to say I enjoy being involved with OSA and appreciate the fact there is a group of Asian art enthusiasts I can actually be part of!!! It’s the best group that I’m involved with and do feel honoured to be chosen as OSA’s SAM!! . A fun little project you can make to display a calendar gift card in. When the year is out, take out the calendar card and display your favourite photograph in the frame. This simple card sports a monthly calendar (3.25″ x 2.5″) that I was able to print off on Splitcoaststampers online. You don’t need a lot of supplies for this project as you can see below in the photograph. a piece of paper cut into 11.6″ x 8.25″ (or for the metric savvy people out there, 29.7cm x 21cm). 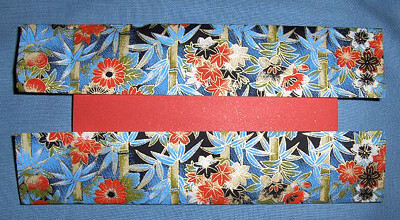 a base piece of 4″ x 6″ cardstock (10.2cm x 15.3cm). 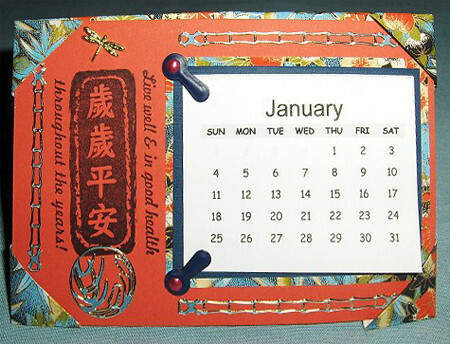 Calendar itself is layered onto a small piece of cardstock which in turn is layered onto a piece of the same design paper that I used for my origami frame. Using the template provided on SplitcoastStampers, make your calendar pieces as per instructed. When all of the pieces have been cut out, stack & clamp them tightly together. 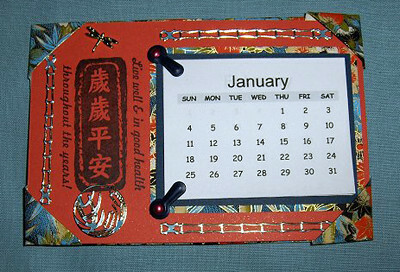 Using a little PVA glue, line the top edge of the calendar pages to create a glued edge. Set aside and allow to dry thoroughly. Fold the bottom portions outward to the front and back of the piece and smooth out again. 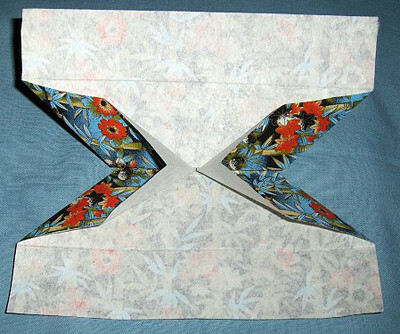 Fold the to the back of the piece and leave there. It will eventually become your basis for the frame. You can see how it looks at this point in the photograph here. 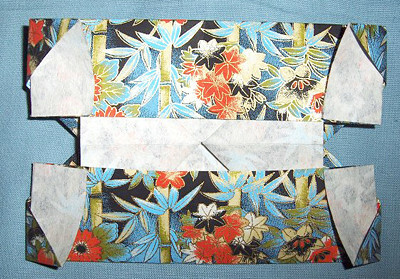 This photo shows how the piece looks like inside (back view with the folded peak). I have opened it in the center to show you what it should look like at this point. 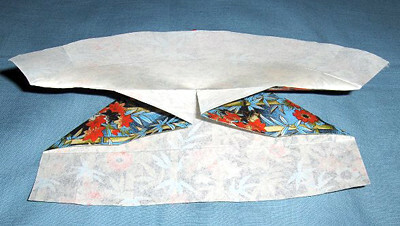 Once you have completed opening out your piece between step 6 & 7, you will note there are two triangular pieces inside. 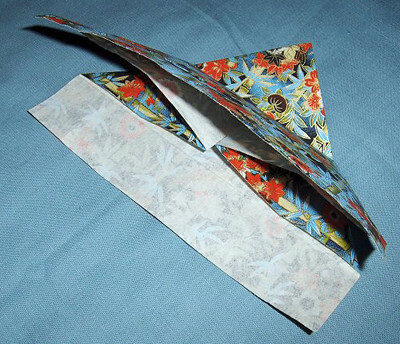 …which are squashed flat to make the piece lay open. Once this is done, you will take your 4″ x 6″ card and lay it over the mid-section of the piece. 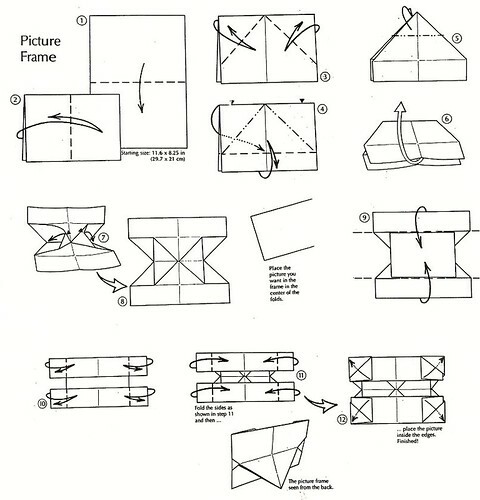 Use the 4″ x 6″ card as a guide for where your next folds will be (see diagram for folds at 10 and 11). and the folds over both sides. 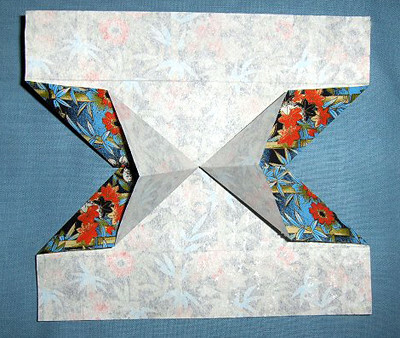 Once these folds are complete, you will need to remove the card by carefully opening the last sets of folds and removing it. Refold the last steps and you have your completed frame! 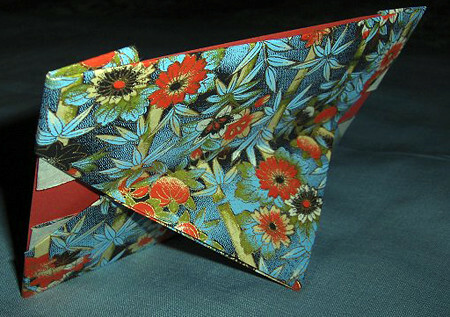 You will see little triangle pockets in each corner of the folded piece. 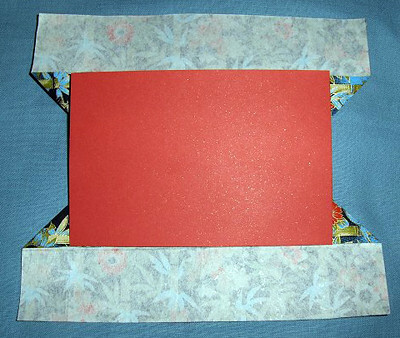 These will be the corners that hold your card in place once it is ready! Layer the small calendar onto corresponding cardstock and paper. 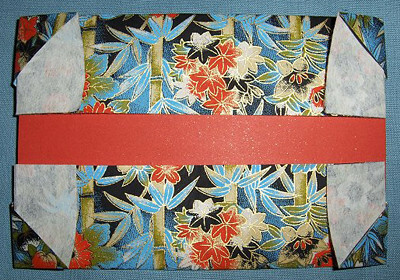 The card itself is quite easy and here you can be as creative as you wish. Complete your stamped artwork where you would like on the card (I did mine on the left hand side using a stamp from SeeSaw Graphics). 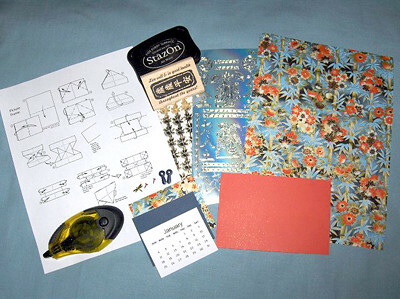 Next, glue the calendar onto the card and add the embellishments that you wish onto the front. Pop the completed card into the frame and there you have your gift calendar card, complete with an origami frame to display it in! You can see here how the card looks standing upright in the frame from the front, and the backside where the folded peak is used as the stand to hold it up. This could a be great Christmas card idea to help ring in the New Year! Enjoy!